Been back from TNNA for a couple days now. The trip went really well and was a lot of fun. Driving there went well. We took our time and tried to stop at a few yarn shops on the way. The first one, Colorful Stitches, was closed on vacation, the second and third were non-existent and the fourth one, Indigo Yarn (somewhere in New York State), finally, was open. TNNA in itself was really impressive. It was huge and there were tons of celebrities around! I got to see Cat Bordhi, Norah Gaughan, Kristin Nicholas and Stephanie Japel, talk to Cookie, Stephanie McPhee and Anne (Knitspot). I wasn’t part of the “in” crowd so didn’t get to do the fun things that you might have seen around the blogs. But it was fun nonetheless and now I know what to look forward to next year! We got lots of new yarns and accessories for the store and got to see lots of interesting things. So it definitely was a great trip overall. An hour into the drive back to Massachusetts, our AC broke down… We drove for over 10 hours in 90+°F with the windows down, lets just say it’s not an experience I would like to do again. I was able to do a bit of knitting while traveling and was able to finish the 2 socks I had been working on. The first one was my Noro Kureyon Sock. I’m really pleased at how it came out and plan to knit the second sock exactly the same. Hopefully the yarn will cooperate with me! The second sock I finished was the Rococo sock in O-Wool Classic 2-ply. This one was fun to knit and looks really awesome. Anne is really a great designer! Before leaving for the show I really wanted to do some sewing, especially after seeing Alyson‘s new bag (scroll down a bit)!. 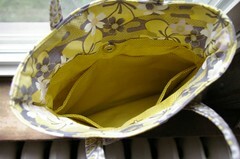 A while back I had bought this fabric to make Amy Butler’s Frenchy Bag. 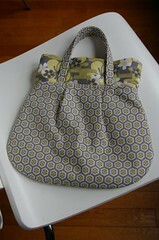 It’s a fairly small bag (I made the handbag rather than the shoulder bag) but it’s really cute. I will be making the shoulder bag next time though! 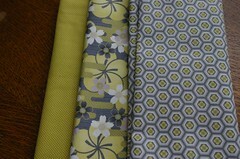 The fabric I used is by Timeless Treasures fabric, the Wasabi collection. I really loved those prints together, although it doesn’t really match anything I own. I’m quite pleased with the final product. It was a bit fiddly at times but it came out pretty good. That’s all for now. More in a few days! Cool bag! I just learned how to use my sewing machine. God help me when I find Amy Butler fabric in person. That bag is stunning!! Hey, how many stitches did you cast on for the Noro sock? I’ve got a skein sitting in stash and was wondering if it will stripe appropriately. Yikes about the AC – that would give me flashbacks to horrific childhood vacations… That Noro sock is gorgeous… I’ll cross my fingers about the yarn cooperating for sock #2! 🙂 Did you see Franklin’s post about TNNA? SO funny. Very cute bag. Love your fabric choices! I hope you weren’t knitting the Noro sock while driving in the 90 degree heat! Super cute bag! I love the fabrics. Glad you had fun at TNNA. Sorry to hear about the a/c breaking. Ugh! I love all the sewing you do. The results are always so cute. You know, I have a birthday coming up… Hee! Cute bag! Thats makes me want to sew something. I really like your sock out of the Noro. Cute bag! And (as always) awesome socks. 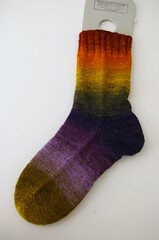 The Rococo sock is so pretty and delicate-looking, and the Noro is, well, Noro-liscious. What a pretty bag! It would make a great project bag too. It could coordinate with a larger handbag. TNNA sounded like great fun, though the drive without AC was vicious! Yikes.